This Nativity is made from dyed handfelted wool by a group of women in Kathmandu, Nepal. 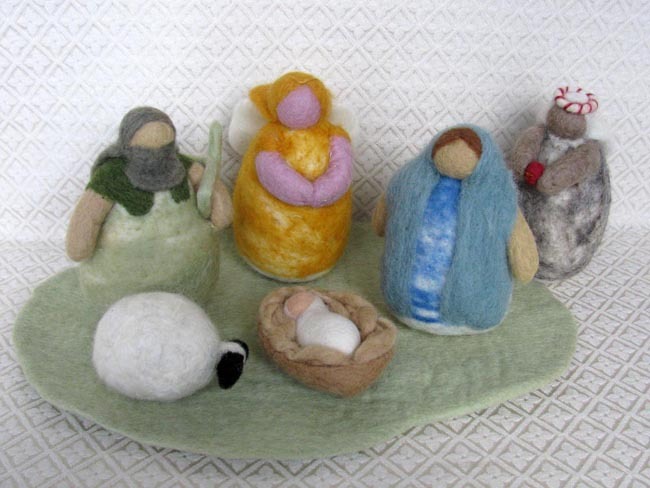 The set contains 7 pieces: Joseph, Mary, baby Jesus, an angel with wings, a plumply round sheep, one king with gift, and a green wool mat that the figures are displayed upon. Joseph stands 6 inches tall. The artwork of these Nepalese women is imported and marketed by an organization that has worked with over 1,000 Tibetan, Indian and Nepalese artisans over the past 25 years. The organization raised funds after the 2015 Nepal earthquake to support their producer partners in Kathmandu, but it was mainly through the resilience and commitment of the Nepalese people that they were able to maintain their business operations and go forward.